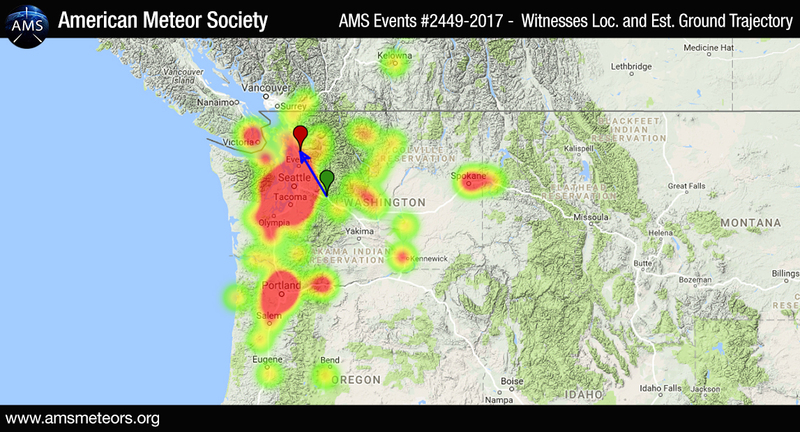 The AMS has received 888 reports of a fireball event seen above the state of Washington on July 29, 2017 around 9:54pm PDT (July 30, 2017 ~ 04:54 Universal Time.). The fireball was seen primarily from Washington but was also seen as far south as Eugene, Oregon and as far north as Enderby, British Columbia. There also have been a few reports from Idaho. 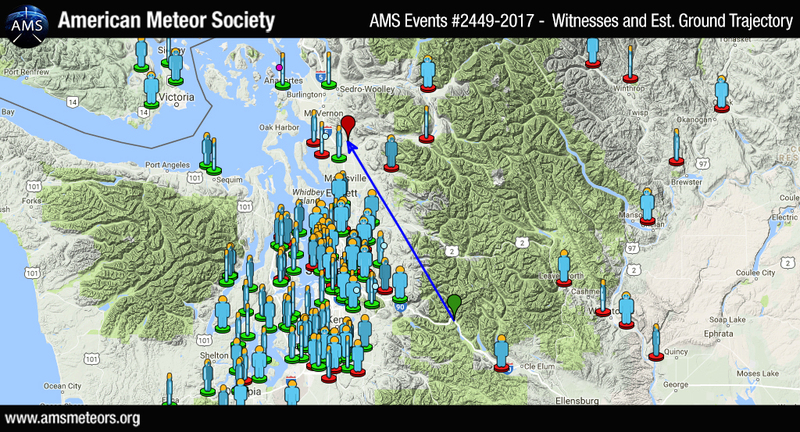 According to our latest estimated trajectory, the fireball traveled in a southeast to northwest direction passing just east of Seattle and terminating in a mountainous area just northeast of Pilchuck on highway 9. In Washington State shortly before 10:00 PM- 7/29/17- it was a huge ball of fire! We also saw it while camping at Rimrock lake! We also saw it camping in Rimrock Lake! On the Columbia River about 9:45 and it was very beautifully florescent blue/green. Our 3 year olds first shooting star or otherwise Fireball. We saw it about 9:00. The sky was pink way off in the distance in Nelson B.C. I saw one years ago..glittery pink with a sparkler kind of noise as I recall over Machias..most amazing thing I ever woke up to! We saw it in Tillamook, Oregon. Several seconds of bright white and green light. So beautiful! Saw it while watching outdoor movies at the Mural at Seattle Center. Most striking meteor I’ve ever seen. Lasted over 5 seconds. Just incredible. I was there too! At first I thought it was some bizarre firework. It looked like it was on a collision course with the Space Needle! I was right there with you at the theater I have a good description on my Facebook wall. “Everyone at the outdoor movie night at Seattle Center got a clear shot at seeing it. We were at the mural stage facing east looking at the space needle. It came in from the south looking yellow redish like it was just a plane. Getting close to the horizon behind the needle it started to break up and visibly burn bright blue i saw also maybe a little green my friend thought. I was big enough and slow enough to look like the dimensions of a firework mortar going up but this instead wad headed sideways south to north and could be seen facing east if looking at the space needle. If anyone has weather cameras looking at the needle we might get footage. We did see it burn up after it was about 3/4 across the sky. Shooting stars are just pin points of light this had shape and size of a small meteorite. This makes the forth large one I’ve seen in my 35 years of life not including small shooting stars in showers. It was not the biggest I’ve seen but it was much bigger than those seen in showers. We were in Buena Vista, Oregon when we saw it around 10pm. We had seen 3 prior to that and this one was larger by far. I was sitting out on my deck in Hauser Lake Idaho and I saw it perfectly. It was gorgeous! Right before that I saw the International Space Station flying by. A perfect night for outer space events! We were on a evening cruise Moses Lake and saw it! Super Cool! Saw it in Leavenworth WA. Incredible! I was at the Columbia River gorge bluegrass festival in Stevenson Washington which is held in a huge open gap along the Columbia River; The fire ball traveled slightly southeast to northwest based on reference to Polaris the north star. It traveled from horizon to horizon over a period of 4 to 5 seconds. It had a brilliantly glowing head (like a flaming match) and a picture perfect streaming tail, and even though it was dark I could have sworn that you could actually see a visible smoke trail. It did not make any noise that I heard. Numerous others camping around us all jumped up and Hollered “Did you see that” We played music until around 2:00 A.M out under the stars, but had no further sightings. Very Cool. I was at the festival in Stevenson about 20 years ago or so and we saw one then as well. We saw it approximately 9:30 p.m. near Leavenworth, WA! It was very colorful! We were there camping and saw it too! So cool! We saw it in Su.mit WA. About two seconds worth then it seemed to blink out. Wow! The kids and I saw it around 1000pm in Shoreline WA,It was amazing!!! Live in Raymondville TX. Have actually seen quite a few. Didn’t realize you could report these events. We saw it in Moses Lake, WA. It was very bright. Friend and I were attending the Seattle Astronomical Society event at Green Lake. Got to see it with a bunch of star gazers. It was awesome! appeared close to the earth, large and had a vibrant green color. I saw it in Friday Harbor Washington it appeared to be over the Harbor. bright red long tail and bright white at the middle to end of it. small flash of red light then it disappeared mid sky. It was moving faster than a plane. Real fast. We saw it as we were looking northeast onto Commencement Bay in Tacoma. Seen from Methow along Hwy 20 W of Winthrop. A number in our group witnessed it. One SERIOUS fireball. Definitely the largest meteor I’ve ever seen. Exciting to witness for that element alone. Wonderfully long notably multi-colored tail (red, orange, green and blue.) Beyond the size of the fireball most unusual was this: it wasn’t streaking down but instead fully appeared to be running more parallel to the horizon. It’s path seemed as described via the map ==> SE to NW. I’d rather be lucky enough see more meteors like this one and aurora borealis than a complete solar eclipse. First report I’ve read that matched nearly exactly what I saw up here in Darrington- very unusual flat trajectory nearly level with the horizon- saw the same large ( went across 2/3 to 3/4 of the sky ) tail with the same colors you described ( literally like a rainbow in the dark ) also the largest meteor? fireball? I’ve ever seen, still has left a major impression on my mind- glad someone else saw the full spectacular display and “strange” trajectory- I actually don’t expect to see such an event again in my lifetime, but feel highly privileged to have seen this one- peace man! Keep on viewing! We saw it last night while looking up to see the space station. Greenish in colour with a good size flaming yellow orange tail. Saw it from Highway 90 west outside Spokane, Wa. It very bright and curved across the night sky. Bmor – I was beginning to believe I was the only person on Key Pen to view this spectacular event. No one I know here saw the fireball. Sitting on my deck watching Joe’s Bay by moonlight, there it was – a huge, vibrant green cigar shaped something racing across my vision. Gave me the shivers, but made me feel grateful! Saw it while camping at Bolean Lake Resort in BC Canada. I had never seen anything like that before. I have no idea if this is what our neighbor kids seen or not but they were camping out and they said they seen a big red light shooting towards the ground and they told us it was aliens we just laughed it off thinking they may have seen a shooting star and that is a possibility I guess but we live clear on the east side of Indiana in the northeast corner of the state but I know they seen something but they were sure determined it was an alien spaceship. My Husband and I saw it at Bolean Lake just outside of Falkland BC. It was amazing to see. Three of us saw it up at Spray Park at Mount Rainier. Brilliant Green color. I saw it while watching Darius Rucker at the watershed festival in George, Wa. This happened over my Snohomish backyard during a huge Tiki party I was throwing. Everyone saw it! It was a perfect addition to the party. That thing was huge!! Saw it on Lake Washington. Amazing! July 28th 9:30pm PDX near airport large bright blue fireball headed North burnt out slower than the next few we saw around 12:35 12:40am both of those were smaller and burned bright orange. We saw it in Wenatchee. Beautiful sight! We saw it in Creston BC. Saw it from Yakima, WA around 10pm. It was right below the Big Dipper from my view point. It was bright, lasted a few seconds, and then extinguished with a bright glow. Nothing I’ve ever seen before! I didn’t hear any sound associated with it from my location. Several of us saw the fireball while camping at Big Pines in the Yakima River Canyon (Hwy 821), approximately 12 miles north of Yakima. It travelled from the SE to the NW. Intensely glowing white “head” with mostly red and some other colors around it, and a long “smoke” trail. Curiously, it seemed to travel slower than a typical meteor because I was able to point it out so that others saw it too. We saw several “shooting stars” that weekend, (one from E to W, the night before, across whole horizon, was especially memorable), but this fireball is the most astonishing meteor we’ve ever seen. Saw it from Bellevue WA. Streaked right overhead, south to north, steady greenish white color, maybe as luminous as a bright Venus. No smoke trail or sound afterwards. Moved amazingly quickly, perhaps 10X as fast as a typical jet at 30,000 feet. Saw it from downtown Seattle – it was beautiful! We saw it in Snoqualmie Wa! We have video of it too. Totally forgot about it until I saw this post on FB! Does anyone know what it was? This was a fireball which is a meteor that is larger and brighter than normal. Fireballs occur all over the world every day. They are short lived events and this is why people see so few of them. This one just happened to enter the atmosphere over Washington on a clear night during a time when lots of people were outside. Since some witnesses close to the line of flight heard delayed sonic booms, there is a chance that some fragments of this fireball may survived all the way down to the ground. These fireballs are unpredictable events but you can increase your chances of seeing another one by viewing during one of the major annual meteor showers. The next major annual meteor shower is predicted to occur on the night of August 11/12 when the Perseid meteor shower reaches maximum intensity. There will be a bright moon later that night but despite the moonlight there still should be plenty of bright meteors to be seen. Thank you, Robert! Has the location for where it landed been identified yet? It was the first fireball I have ever seen and I’d love to take a trip to visit it. It is not known for certain whether remnants of this object have actually reached the ground. We have a pretty good idea of where they would be located but no proof as of yet. I imagine that many folks are looking for it but it is like finding a needle in a haystack (as they say!). Do you know where (the location) meteor will appear and approximate time? Also sims like many people had swung it but no one has a picture, strange. If people and so many sees it why there is no one posted a picture or video of it? I never saw it yet.. and would love to see a picture or video.. The Perseid meteor shower is not a single meteor but a “shower” of meteors that is best seen on the night of August 11/12. They can be seen all night long but will be most numerous just before dawn on August 12. Concerning the Washington fireball, we have seen a couple of videos of this object and are currently trying to obtain permission to post them on our web site. Camping on a high ridge above Lake Kachess with a full clear view and discussing how the stars would be awesome when it flashed as a bright star straight overhead. It gained a short white tail of sparks appearing to head straight towards us for a few seconds before changing colors to a really brilliant blue green fireball as it went overhead. Appeared to land to the Northwest between mountain ridges. Largest fireball I’ve seen. Awesome sight and was surprised that it was completely quiet. Saw a lot of shooting stars during the night, however nothing compared to that first one. Saw it Vancouver, /wa. Reddish fore end, white center, greenish aft. Bright, and slow, slower than a falling star, and brighter. saw it from lake chelan. huge fireball, green, blue and red. long white trail of smoke. moving slowly. Amazing!!!! A group of us saw it at The Gorge in George Washington. We were at Watershed watching the closing act, Darius Rucker perform. So beautiful against the Columbia River Gorge landscape!!! I was with my boyfriend riding on the 410 in between the Nile and cougar valley. We both saw it and thought it was a flair at first. I have never seen anything so big or bright. The most vivid greens and blues. Was so lucky to see it with out any other light pollution! Absolutely stunning!!! My Grandson Chris and I were sitting out on my balcony facing west when a fireball crossed in front of us..low on the horizon..heading North..it was green/ blue fireball..as it passed you could hear a hissing sound..then it disappeared heading north towards Seattle. We were at the Watershed festival at the gorge and almost everyone saw it there in the middle of the concert! Everyone It was honestly so cool looking and couldn’t of happened at a better time. Absolutely amazing!! It flew right over my house! I couldn’t beleive my eyes! I was walking from the car and there it was a huge fire ball over my head! I wished on it, I saw it coming from a distance and watched it fly right over my house! Incredible I’ll never forget it! I on the plateau live in Duvall. I saw this while at Watershed ! Wasn’t sure what it was – (or if was the beer)- but no one around me seemed to see it. Going to fast for a plane, too big and low for a shooting star. Good to know I wasn’t just seeing things! Seen it from Walla Walla just before 10pm. Much brighter and slower than a shooting star. Almost flying horizontally from SW to NW. A group of us seen it in Tumwater washington. It was so cool to watch! Saw it coming across the sky while at a friend’s wedding in oso. It faded out right over our heads. Thought it was just a meteorite falling, but was the same time. My friends and I saw it near the Sauk River in Washington State while we were camping. It was visible around 10 pm and was bright, had a very long tail, and was huge! Lasted at least 7 seconds. We had never seen anything like it. I watched it from Timberline Lodge at Mt.Hood. it was very bright. Four of us saw it from the Phelps Creek Trailhead at Trinity (about 25 miles from Lake Wenatchee in central Washington). There are no city lights out there so it was really bright with a long white tail. Seemed like it was just above the tree line. Witnessed from Kennewick, WA from the Clover Island Yacht Club during the “Rockin’ the River” party Saturday night. Saw it while watching Movie at the Mural in Seattle. The meteor went right across the sky behind the space needle. It was bright and had a green hue to it. My husband thought it was a shooting star but it lasted much longer. We saw in Omak Wa!! It was beautiful. A quick burst of light across the sky!! We saw it from downtown Portland looking north over the Willamette. Started as just a ball then a long tail formed for a second or so. Absolutely incredible! Very interesting to see how the altitude made it appear like it was over us when it really was far north of us. I saw it from the “Climber’s Bivouac” camping area on the south side of Mt St Helens. It was colorful. Like others mention, we saw the ISS go by shortly before, and afterwards, I saw a couple of sun glints from satellites. Saw it when I was taking out the trash it was super bright and different colors. I saw it break up also. I have seen a lot of shooting stars this one was the best!!! It lasted for a little while. My husband and I saw it near Davenport, WA in Eastern Washington around 9:30 -9:45 pm. It started out a green and then turned gold and them green again before flashing gold again and then out. We saw it while in Washougal WA at the National motocross races. A bunch of us were outside camping when we saw it. Vacationing in Orondo, Wa. It was big, bright, long tail, and listed for about 5 seconds. Saw it in Richland, WA during a walk. It was the longest, brightest, biggest fireball I’ve ever seen. 5 to 7 seconds. I immediately looked at my phone for the time. It was 9:54 pm. I then got out my compass and it disappeared at 330 degrees. Totally incredible! WE saw it at the Pixie Dust Music Festival. We saw this in Bonney lake!! It was the brightest slowest moving ‘shooting star’ I’d ever seen. Bright green and blue flare slowly lit the sky! Saw it in La Center WA. A large ball of it crossed over Lake Crescent, as we sat at the fire pit. My friends and I were in Irrigon Oregon and they seen it fly by. I missed it, was in the house when it passed. About 5 seconds of WOW that is cool. It was amazing and am so glad we were there to witness it! Hundreds of concert goers witnessed the fireball at the Gorge Amphitheater in George, Washington during Darius Rucker’s performance! I was looking out my window (in Aberdeen, WA) facing north and saw this large green bright light flashing across the sky from right to left. Awesome. Me again, the light wasn’t flashing… it just seemed to ‘flash’ across the sky. Saw it in Vancouver, WA while on I5. It seemed so close i thought it burned out right in front of me! My husband and I saw this fireball at about 9:45 pm July 29th while driving along I 5 through Portland, heading north. What I saw directly ahead was a bright yellow tadpole-shaped object with a curved tail. My husband thought it was yellow-gold in color with a tail. We both thought it was big and was moving rather slowly, unlike a meteorite. It appeared to be so close because it was big. I remember thinking at first it was a plane on fire and that I would soon hear an explosion but, of course that explosion never came. I saw the meteor from the Yakima River Canyon, just north of Selah, WA. Bluish green and “huge” compared to your typical shooting star. It seemed to last about 10 seconds before flaming out. We saw from the time it happened and to the end. It was so amazing. We where camping along Skate Creek RD. WA. We saw this amazing ball of fire move north, across the sky, when we were camping at Lodgepole Campgrounds in Naches, WA. It was incredible, and we were curious if we’d see news about it once we got back to town (cell reception). We saw it from Horsehead Bay, Gig Harbor, WA. Very bright fireball to start due East of our location, then with a noticeable light blue/green tail. Ended green without a tail to the North. Lasted about 5 seconds. Highlight of the night sky that night! We were outside and I saw the green, blue and gold fire ball in Lakewood wa, it was amazing! No one else saw it, they thought I was seeing things until they saw the news the next day. There have not been any reports from Montana. Aren’t you folks on Mountain Time? This would put your event at 8:30 PDT, much too early to be related to the Washington fireball. We were at a backyard party in the Greenwood neighborhood of Seattle. Several people saw it before me and pointed towards the east. I turned to see it and it remained visible for another two or three seconds. From our vantage point, its trajectory was south to north and gradually higher to lower, it seemed slower than most meteors, got brighter as it went (though very bright to start with), and finally blinked out. Towards the end of its flight — perhaps the final second — I saw a distinct green color. I was with my husband Ty and our friends Jono and Rayce in Jono’s backyard near downtown Victoria BC. We all saw it and couldn’t believe how big and slow moving it was compared to any “shooting star” type thing any of us had seen before. It was so strange how it seemed to be completely horizontal to the horizon as well. It was absolutely stunning! Yes, we saw it in Hillman City, a Seattle neighborhood near Columbia City, it was stellar! I saw it while driving north in Northern California just south of Williams. Lake Cle Elum sighting. It was beautiful – blue/green. We were outside my place in unincorporated Goldendale Washington watching a movie and saw it. Huge! Me and my lady saw this spectacular event from a very clear sky in Darrington, Wa it started as a white ball, streaked across 2/3 of the sky almost due north/northwest- first colors on the tail were blue to greens, then yellow orange to reds, at the end it split into 3 almost lighter, luminescent 3 small circular balls and was finished- never in my life have I even seen such a stunning, mind blowing celestial event- Fireball or meteor? Hardly….seen plenty of those, none have came close to that- looked more like space debris/defunct satellite or a mis-fired test ICBM- would like to point out all these BC fires started pumping all this thick smoke into the Pugeot Sound area just days after this event, including a fire in Darrington the next day after the event- something hit the earth….personal eye witness to the fact…. Saw it while camping near Leavenworth WA. There was no ambient light in the sky and it looked large and close, moving in slow motion. Beautiful! We were on an east facing beach near Nisqually, WA sitting around a campfire when it flew into view heading north going so slow I thought it an errant firework at first. It seemed very close, a beach ball sized white hot sphere with blue edges and a fiery tail. The 4 to 5 second reports seem right. Now that read of the trajectory and distance it traveled, I am even more amazed. Hard to gauge the size of something that could light that much sky so brightly for so long. We saw the tail fade away then it sputtered and died. I expected to fall into Puget Sound a few miles from us when it was actually more than 100 miles away. We were at our son’s outdoor wedding reception in south Seattle and saw it! Perfect for the occasion!! I was able to see serveral flashes of bright light in the sky. Very very smokey here. Lincoln wa on the bank of Lake Roosevelt. Right around 10:00 pm. Wasn’t watch clock. Looked like white light. Just to let you know, I saw it ahead of me while I was driving north on I-5 in northern California north of Williams. I haven’t seen any other reports from so far south, but I’m sure it was the same event.